Hey all, I see from my stats page that someone ran a whois search for this site. If you have any questions or comments or need something specific feel free to drop a note through the "Contact Us" form or leave a message in the comments box. One of us will be glad to answer your questions. While you can get away with jumping right in on a sewing project and grabbing your sewing supplies as you go, gathering the supplies you will need before you start makes your task easier. My next project is going to be a fairly simple one: dressing up an aging blue sweatshirt jacket by adding some colorful appliques. The jacket flaunts three small holes, and it is time to either cover them up or throw away a very, very comfortable favorite jacket. I'll pop back in to add some before pictures, and to explain the steps, then finally I'll add an after picture. Sewing Supplies image (far right) courtesy of Wikimedia Commons. The value of a sewing box is one of those things a non-sewer can never really understand. Sadly, sometimes the day comes when you pick up your trusty sewing box, and something falls off or it breaks apart in your hands. When I decided it was time for a new sewing box, well technically the box decided for me, I couldn't bear to part with it so I emptied it out, filled it with some vintage lace I wanted to save, and put it up on the shelf. I then made a list of all the features I wanted my new sewing box to have, and started shopping. It needed to be big, with easy to manupulate spaces, and, frankly, it needed to be pretty. I looked at a lot of great sewing boxes and storage organizers before deciding one box could never meet my needs. I picked a sewing box with classic appeal for my hand-sewing and embroidery supplies. I followed the old fashioned box with a tool-box sized snazzy pink, multi-compartmented plastic organizer I found at the local JoAnn Fabrics store. Heart buttons image by Scott Chan/ Free Digital Photos. If you cannot fit your entire message in the text box, feel free to leave your email address and a main word or two and we will get back to you. Feel free to share your question or comment in the text box provided. Log FilesLike many other Web sites, www.stitchingitright.com makes use of log files. The information inside the log files includes internet protocol ( IP ) addresses, type of browser, Internet Service Provider ( ISP ), date/time stamp, referring/exit pages, and number of clicks to analyze trends, administer the site, track user’s movement around the site, and gather demographic information. IP addresses, and other such information are not linked to any information that is personally identifiable. This license shall automatically terminate if you violate any of these restrictions and may be terminated by Stitching it Right at any time. Upon terminating your viewing of these materials or upon the termination of this license, you must destroy any downloaded materials in your possession whether in electronic or printed format. The materials on Stitching it Right's web site are provided "as is". Stitching it Right makes no warranties, expressed or implied, and hereby disclaims and negates all other warranties, including without limitation, implied warranties or conditions of merchantability, fitness for a particular purpose, or non-infringement of intellectual property or other violation of rights. Further, Stitching it Right does not warrant or make any representations concerning the accuracy, likely results, or reliability of the use of the materials on its Internet web site or otherwise relating to such materials or on any sites linked to this site. In no event shall Stitching it Right or its suppliers be liable for any damages (including, without limitation, damages for loss of data or profit, or due to business interruption,) arising out of the use or inability to use the materials on Stitching it Right's Internet site, even if Stitching it Right or a Stitching it Right authorized representative has been notified orally or in writing of the possibility of such damage. Because some jurisdictions do not allow limitations on implied warranties, or limitations of liability for consequential or incidental damages, these limitations may not apply to you. 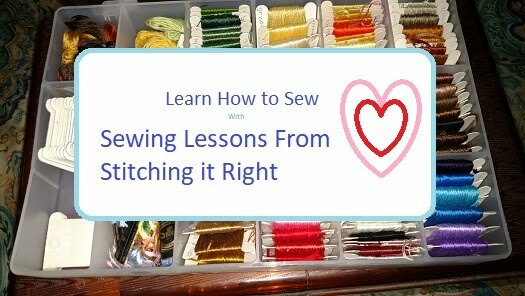 The materials appearing on Stitching it Right's web site could include technical, typographical, or photographic errors. Stitching it Right does not warrant that any of the materials on its web site are accurate, complete, or current. Stitching it Right may make changes to the materials contained on its web site at any time without notice. Stitching it Right does not, however, make any commitment to update the materials. Stitching it Right has not reviewed all of the sites linked to its Internet web site and is not responsible for the contents of any such linked site. The inclusion of any link does not imply endorsement by Stitching it Right of the site. Use of any such linked web site is at the user's own risk. Any claim relating to Stitching it Right's web site shall be governed by the laws of the State of Ohio without regard to its conflict of law provisions.
.:: Google's use of the DART cookie enables it to serve ads to users based on their visit to www.stitchingitright.com and other sites on the Internet. www.stitchingitright.com has no access to or control over these cookies that are used by third-party advertisers.